While you are not always at the office there is usually work to be done. 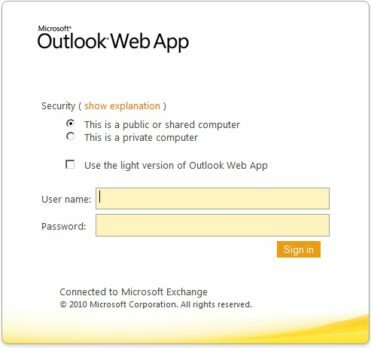 With Outlook Web Access or OWA you will have access to your email, calendar, contacts, and other items wherever you have an internet connection. That’s a major bonus in today’s always working world. Web Access to my email! That’s what I’m talking about. With OWA your workers will be able to check their emails wherever they have an internet connection. This is increasingly important in the modern business world. Sometimes, in the middle of the night, I get up, turn on the computer, gain access to my email through Outlook Web Access, and read my mail. Awesome. It’s just the way business is done. You can’t put a timeframe on when you might need to read or send an important email. With twenty-four hour access to your calendar you can keep up-to-date with any changes in the schedule as they happen. It’s just part of doing business in the modern world. The appointment changed while I was on the way there. No problem. With OWA calendar access you’ll always be aware of any changes to your schedule even if you’re not in the office. SmartPhones are playing an increasing role in today’s business world and with OWA; if you have internet access you have access to your email. If I’m there, my phone is there. Communication is one key to a successful business. With SmartPhones and OWA seamlessly connected you’ll have access to the data you need, when you need it. Attachments play a major role in the way we do business today. If you need to see data that’s in an email attachment all you need is an internet connection and OWA. Who even sits at a desk anymore? For always available access to important attachments you need to be able to get to your email anytime, anywhere. OWA provide the ability to do it. The business world of the 21st Century relies on instant and reliable communication. If you don’t have access to your emails, to your calendar, to your attachments; then you can’t communicate effectively. OWA, the web communication tool. Hosting solutions that work. Acumen Consulting.